NEW YORK (CNN) -- A reflective U.S. President George W. Bush has said he regrets some of his more blunt statements on his so-called war on terrorism over the last eight years and wishes he had not spoken in front of a "Mission Accomplished" banner only a month after U.S. troops in Iraq were deployed. George W. Bush says his wife told him that as president, he should watch his words carefully. "I regret saying some things I shouldn't have said," Bush told CNN's Heidi Collins when asked to reflect on his regrets over his two terms as president. "Like 'dead or alive' and 'bring 'em on.' My wife reminded me that, hey, as president of the United States, be careful what you say." The interview, aboard the USS Intrepid in New York, came after the president addressed a Veterans Day ceremony. 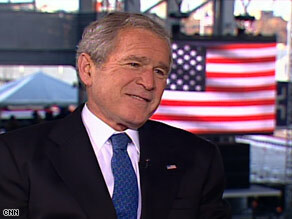 Bush was also criticized in 2003 for his answer addressing insurgents in Iraq. "There are some who feel like that the conditions are such that they can attack us there. My answer is, bring 'em on," he said then. On Tuesday, the president also referenced the moment aboard the USS Abraham Lincoln on May 1, 2003, during which he declared an end to major combat operations in Iraq. "They had a sign that said 'Mission Accomplished.' It was a sign aimed at the sailors on the ship, but it conveyed a broader knowledge. To some it said, well, Bush thinks the war in Iraq is over, when I didn't think that. But nonetheless, it conveyed the wrong message." The president, whose legacy is sure to be hotly debated for decades, said there also is much he is proud of. "I am proud to be the commander in chief of people who are so selfless and so courageous that they would volunteer to serve our country in a time of war," he said. "I'm proud when I see people feed the hungry. I'm proud when I'm in Africa and see volunteers helping those citizens dying of HIV/AIDS."